1.In small bowl, whisk 1/4 cup lemon juice, shallots, tarragon, honey and salt; whisking constantly, drizzle in oil until emulsified. 2.Heat large covered saucepot of salted water to boiling over high heat; add tails and return to boiling. Reduce heat to medium and cook 2 minutes; remove and let cool. 3.Prepare outdoor grill for direct grilling over medium heat. With scissors, cut tail shells lengthwise down center; with fingers, spread shells apart slightly. Flip tails over onto backs; insert 1 metal skewer lengthwise into each tail through the center of the meat. In small bowl, whisk butter and remaining 1/4 cup lemon juice. 4.Place tails, cut side down, on hot grill rack; cook, covered, 2 minutes; turn tails. Evenly pour butter mixture onto meat; cook, covered, 1 minute or until meat turns opaque throughout. 5.Remove meat from shells; chop half the meat. 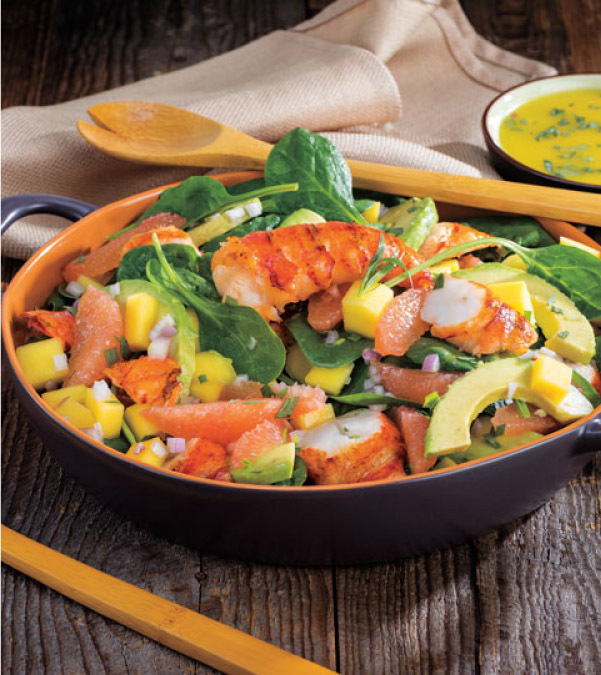 Divide spinach over 4 plates; evenly divide meat, grapefruit, avocado and mango over spinach. Drizzle salads with dressing.